« David Kinnaman is wrong: How the church really lost the millennials & what we can do to keep the next generation. This is a very true blog post. We pew-dwellers do need to have our own sense of responsibility for our own feeding. But I think there is a legitimacy about “not being fed,” and that is what you sense that you’re “not being fed ENOUGH” or what you’re being fed is dreck or just plain not right or true. Christians who clamor for good spiritual nutrition will know when the body is lacking, and, if they’re unable to help effect change they will move on. I have had to do that, sadly, but namby-pamby equipping; non-stringent, uninformed, bored teaching; and pollyannish preaching will do that to some folks. And about that matter of preaching: It’s not about equipping, really, but about proclaiming — or perhaps feeding, since it is a means of grace — law and gospel. It, along with the Sacrament of the Altar, really is the most important feeding of all. So I think there is some small truth to be heard when someone says, “I wasn’t being fed.” Maybe it was more than an excuse. It was for me. My humble $0.03. It is difficult, especially if one is sitting under the teaching of one who has lost their faith. On one hand it is the Donatist matter all over again. On the other, there is the travesty of moralism and partisan politics in the pulpit. Thanks for putting in your 2 cents + 1. I don’t think “church hopping” was an option for the early Jew and their temple. We can read the issues of not so on fire priests and it wasn’t every other service fire came down from Heaven.. For me it comes down to more prayer, and more stillness before the Lord. A dry place to enter when you’re spent; but discipline, insight, and answered prayer are the fruit of waiting and a layperson’s calling. Church, or life; begins on the inside. Great thoughts! Thank you. We all need more stillness before the Lord, don’t we? Excellent! Good photo to illustrate the point! Thanks, Lynn! Blessings to you this fine day. Great post, Matt! Hope this semester is going well for you. Life is great. Hope the same for you, brutha. Yes, definitely I’d agree that we shouldn’t leave a church because it’s not ‘feeding me.’ But if it’s not equipping, challenging, helping you grow in faith, then either help the church change or change churches. And more, if it’s a spiritually deadening place, where you are more pushed away from than drawn into the Holy Fire, then run as fast as you can. Indeed! Thank you, Becky. Well said. Hey Matt, I’ve thought about this a bit and think I should follow your lead in my response: My friend Matt Marino, who has many helpful things to say, is wrong.about this one. Very wrong. Few things are clearer in the story than our responsibility to feed the sheep (I know, the metaphor is not complimentary). The question is not whether we are to feed our members, but rather why, what, and how. If we feed them on consumerism, we get the fruits of that. If we feed them on discipleship, we get the fruits of that. Remember Mr. Miagi’s dictum, “No bad student, Danielson, only bad teacher.” This is a complex topic with many layers, whys and wherefores. Nonetheless, in the end we ARE the servants called to teach, preach, disciple, and mentor, i.e. “feed.” I think we do better by looking up and saying something like, “Wow, we’ve mentored a generation of consumers rather than disciples and servants.” We’ve taught them (“fed” them) to think they’re supposed to grade us rather than join us as servants … etc. It’s a matter of leadership not followership. There’s no escape. We all need leaders, servants, mentors, disciplers. Those of us to whom these roles have been entrusted need to look at the fruit of our feeding. Great thoughts, Jim. Thank you for adding your voice to this. You know I’m with you in this Matt. The thing is, our Episcopal ethos has ways of doing life-on-life and not ways of doing it. What we do will look nothing like what Jesus did with his disciples. We cannot mimic him. So what can we really, actually do with the various ages and stages of life in our modern Episcopal context? This is a crucial value and vision for our tradition and its future. Thus, how we talk about it, what we say, what images we use and how those images invite people to imagine it, and especially to imagine the possibilities, are all crucial to the change we both want to effect. Seeing that something is wrong and dreaming a new future are comparatively easy. Building the strategy to the new future is the critical and very hard and very fun work. How we talk about it now will limit or expand the possibilities of that strategy. I am boldly excited and enthusiastic about our future. I think we have a great one. Let’s dream and language carefully in ways that will make it easy for our people to see it, to be encouraged by it, and to say yes to the strategy. I absolutely know that we are in this together! I am thankful to Jesus for that. You have some ideas in mind of what we cannot do that I know not. My thought is that we could each have a group of people that we are walking with who can each have groups they are walking with. Is there something in our ethos and tradition in which that won’t work? I actually think that the Anglican tradition of Morning/Evening prayer in which we read, pray and do the Bible together as a community. My thought is that we can find ways to do that (both together physically and online). A friend and I actually spoke on the phone today about this. We are creating a 4 part webpage: Prayers (a link to an out loud, pray along with site), a Read the scripture plan, a series of short snippets on “Living the story” (the story through the Christian year), and 4: an online way to engage with others around the readings of the day. Sounds good, Matt. Simple. Brief. Accessible. Interactive. Following the MP/EP pattern without overwhelming. A good start, it seems to me. We shall see how it goes. I suspect the key will be how well executed it ends up. Spot on! Many in the congregation would live gearing this from a voice other than mine. Now, we clergy types need to buckle down on the equipping! Thanks for this. The hard work on this will have to be done by us. It involves learning a whole new…a more biblical and beneficial way of leading. Lies from the pit of hell! All this skubalon about how sheep need to learn to “self-feed” is straight from the devil’s backside! Hello Angry, thank you for taking the time to respond. I appreciate that you are quoting Jesus, but Jesus never “fed” the way we are doing it today…Line up in cars and come hear the pablum. Go home and not think about it again. Think about what a shepherd did in Jesus’ day. Did a shepherd invite hold grass up to their mouths or lead them to pasture and let them eat? When we say today, “I want my church to feed me” it means “give me what I want to hear, what reinforces my already held beliefs.” I am arguing for doing more of what you just did, let people be exposed to Jesus’ actual teaching, in a way that Jesus actually did it: Life-on-life, in the real world. So I disagree with you about the devils backside. And I suspect you don’t really think that either, since my rationale is straight from Paul who got it from the Holy Spirit. Thanks again. I look forward to continuing dialogue. And I like your tongue in cheek online moniker. If you are feeding your sheep pablum, then your sheep ought to find a church that is faithful. This “self-feeder” garbage is originating from false teachers that hate the role of pastor. The sheep come to receive Christ, and it is the church’s commission to give him to them. STOP BEATING THE SHEEP FOR ASKING TO BE FED! STOP PRETENDING THEY WANT YOU TO CHEW THEIR FOOD, WHEN THEY ARE ASKING FOR MORE SUBSTANCE, MORE JESUS! They ought to flee from your attitude in droves. These days, many false teachers are propagating the idea that Christians coming to church to be fed are overweight, gluttonous, immature (like the baby picture), or otherwise woefully lacking in restraint and maturity. Usually this is so they can preach insipid Christless pep-talks that are incapable of feeding anyone. INSTEAD FEED THEM! IF YOU FEED THEM THEY WILL BE EQUIPPED TO DO DO DO ALL THE THINGS YOU’RE TRYING TO BEAT THEM INTO DOING! YOUR SHEEP SOUND SKELETAL, ARE THEY ARE IN SPIRITUAL AUSCHWITZ WITH THEIR HIP-BONES SHOWING THROUGH?!?! WHAT THEY NEED ISN’T TO GO BE MORE OBEDIENT, ITS MORE OF GOD’S WORD! Instead of playing that you’re the Auschwitz culinary directory, teaching skeletons to prepare their own elaborate feasts, BRING THE FEAST THAT JESUS COMMANDED YOU TO! YOU BE MORE OBEDIENT FIRST. Feed his sheep. Hmmn “Angry.” You are apparently committed to achieving your name. CAPITALS ARE SHOUTING AND RUDE. You are welcome to engage, but please engage politely. I am not sure what has provoked you so. You have evidently not read my blog before, as I blog long and loud on silly antics from pulpits and pastors preaching pablum and moralistic “how to” sermons, rather than teaching the Bible. Blessings to you, as you seek Christ. You are echoing the satanic lie that has been making its rounds for the last 5 years that Christians should not expect to be fed God’s word at church. My hostility is because your anti-Biblical advice needs to be shot down before some hapless pastor falls for it. And while you can feign that you’re above the fray of harsh words, your picture of baby food and comments about “chewing” your congregation’s food for them is character assassination of those faithful Christians that are holding pastors accountable to their office by insisting that pastors fulfill Christ’s command to feed the sheep. Shepherds are not called to assassinate the sheep that are asking for the shepherd to perform his vocation. Leaving a church that doesn’t feed you is the right thing to do. Leaving a church (or removing the pastor) where the pastor defiantly maintains that its not the pastor’s job to feed the sheep is probably the right the right thing to do as well. Because if that’s the case, the pastor either doesn’t know God’s word, or he knows it, but despises it, and the office he’s been given. If you want to equip people, then FEED them. If you don’t want open angry rebuke, then don’t assassinate the character of Christ’s own lambs, asking to be fed as you were called to do. You have obviously never read my blog before. You might check: https://thegospelside.com/2013/08/21/when-did-evangelicals-get-popes/ in which I critique the same things you are. You might read more closely. I have not said anywhere that pastors shouldn’t teach the Word of God. I am saying that people’s expectations should be that they become active disciples not passive recipients. I am actively arguing against moralistic preaching and for exposition of the scriptural texts. Jesus is the bread of life. You should Hunger and thirst for Christ. Anyone who is not getting “fed” in church should start to rethink somethings. The truth is you are fed through the intimate relationship with Christ. With that said, I also think you have to take a step back and reassess the church to. Every church I stopped getting fed in I ended up leaving because I discovered they weren’t teaching proper doctrine and were not caring for the poor and the widows. The church can’t feed its flock if its not its self hungering and thirsting for God. False prophets will seem to offer food that is seems filling ands by leave because they want that, so that’s another thought to consider. It’s good to be convicted but let us never stop also being aware of false doctrine and false teaching or lack of caring for the poor and the widows. I am sitting here reading a fantastic textbook on preaching by Calvin Miller. Interestingly, your comments very closely mirror the outline of the intro and first chapter. Blessings to you and thank you for writing. What about the references to “spiritual food” in the “Our Father” and our Eucharistic Prayers? Hi Laura, Sacrament is true spiritual food, is it not? The feeding the modern church thinks of is moralistic “how to” sermons. Jesus told Peter to “feed his sheep.” I still think that what we mean by “feeding” (passive and spoon fed) and what a shepherd did in Jesus’ day were very, very different. For example Peter was told, “Feed my sheep.” (I’m about to be disgusting so read past this point well after lunch, please.) A shepherd led sheep to food and protected the flock while they ate. He didn’t pluck the food, pre-chew the food and then dribble it into their mouths like a robin mother with it’s chicks. I keep seeing articles like these and wonder what the church and priest are supposed to do. I see my role as a parishioner to assess my talents and use them as a gift to my church, my community or where ever I am called. There was a time when I went to church I felt inspired, uplifted, challenged or called. Lately most of things I no longer feel. I do continue to feel called to do things and follow through with those things. I remember talking with our current priest and telling her how important that I believed just being with some during a difficult time is. She seemed to not really understand. Several months later she went to funeral of one of the parishioners parents and came back very excited. She said, “that ministry of presence really works. The church member told me how much it meant that I was there.” She was really excited but I really don’t see her transferring that learning to other things. Sermons and homilies are read………poorly. Frequently cannot pronounce words that she has written. Taking Eucharist to the homebound rarely happens. These are just a few of things. Please tell me what I should expect because I just don’t know anymore. I feel this church is where I am supposed to be. There are good people there but somehow I don’t see the saints being equipped. I know this sounds really negative and normally I am not a negative person. I am just really frustrated. God bless you for sticking that out! How is someone not able to pronounce their own words? …And not seeing the Eucharist taken to the homebound is pretty bad. I would be quite frustrated if I were you, Kay. All I can say is that you are a gift to your parish and to your priest. I am glad that she saw the power of presence. Perhaps your presence is equipping the priest? Blessings to you. You sound like someone who is a gift to their parish. Hello Fr. Marino! This was a great post and a message I think many college students (especially) need to hear with clarity. I hear the “I’m just not being fed” complaint from time to time, and it really boils down to what they think is appropriate food. I notice the assumption is often that the best “meal” for Sunday morning is in-depth theology on secondary matters. We’ve forgotten the substantive nature of the simple Gospel message applied to all of life along participation in the Sacramental life. Thank you. You squeezed a ton in a few words: a) secondary issues are not the primary ones. b) the simple Good News of Jesus. And c) Our feeding is Word and Sacrament. I think it’s clear that the pastor is not freed from the charge to feed his sheep. Also, the Scriptures from beginning to end are replete with feasts and with feasting images and metaphors. The fact that the sheep need to be and must be fed is inescapable. It’s not up for debate. I don’t see the writer denying his call as a pastor. It disturbs me when a called and ordained servant of the Word is accused of shirking his responsibilities as such a servant when it’s plain that he’s not proposing that. I stand by my statement that we pew-dwellers need to have more responsibility for our own (spiritual) feeding. By that I mean that we hear the demands of the law and the sweet call of the gospel and see our continuing need to feed on Christ. And so we go to worship with fellow sheep and we are fed with the proclaimed Word and the Word in Body and Blood. Now to equipping. I question more and more whether “equipping” and “discipling” are even legitimate functions of Christian worship. I certainly think they are secondary to proclamation of the gospel (from the Scriptures as well as the sermon), praise, prayer, confession of sin, absolution and confession of faith. I’m content to all but leave moralizing and “application” out. But I agree that in the overall plan, the pastor is indeed an equipper because he is the assembly’s prime visionary, the seer of the whole picture, the leader who pushes the program. But not the deliverer of pablum. Being no theologian but only a pew-sitter who has heard more than his share of sappy, Chatty Kathy, moralizing, self-congratulatory, aren’t-we-really-neat? sermons, I hope this helps. Thanks for the well written and thoughtful response. I sit in pews several times a week and preach in one once a week: so I know this from both sides of the pulpit. I would question whether or not the purpose of the church building – the worship of the true and living God, I am not seeing evangelism as that being purpose of the church on Sunday morning in Scripture. The body of Christ gathered (for instance in Luke 2:42-47), was for equipping purposes (Apostle’s teaching, fellowship, Breaking of bread and the prayers) in order to equip the ENTIRE (sorry for the caps, I don’t have italics here) body to do evangelism the other 6 1/2 days a week. blessings to you as you follow Christ. If I understand correctly, I’m with you and can “accept” (very humbly) that definition of “equipping.” No evangelism, no-seeker services (and no communing the unbaptized, let alone any other confessional strictures). “Proclamation” means speaking and hearing law and gospel. In that setting it’s primarily for members of the church/fellowship/assembly/community of believers, but by all means let unbelievers and “seekers” come and listen and perhaps hear. I have to compliment my own pastor here, whose sermons are always directed straight to the members of the congregation. And our “altar call”? Each time we approach the Body and Blood with opens hands, confessing, “I need you.” Thanks for letting me spout. ‘Nuff said. No apologies, your “spouting” is really excellent, solid stuff! I’m pretty sure I am 100% with you on everything you wrote. I, for one, think that most churches are “feeding” their people. But it is a steady diet of poison (the law – what we should, ought, or must be doing)…and hardly any meat, the gospel of the forgiveness of sins for real live sinners of the highest order. Boy that sure is sadly true. I think it’s clear what your point is in this post, but that may just be because I’ve heard too many people use this as an excuse for hopping from one church to another. I’m not saying that it’s never a good idea to move churches (for instance, when relocating across the country, or when beginning a ministry within a church that needs your gifting [applies to lay persons as well as clergy]), or that you shouldn’t be fed truth from God’s Word… but then, I don’t think you’re saying those things either. What I’ve noticed is that often the ones who constantly move from one church to another because they’re “not being fed” are likely not actively engaging in the church community, and using their gifts to help the church as a whole… it may not be intentional, they may just be so focused on what they’re not receiving that they forget that as part of the body, they have something to give, too. The issue may be that people are looking to receive from people what they ought to be accepting from God – their acceptance, self-worth, and purpose, etc. When they show up and people don’t recognize their talents and gifts right away, or notice them enough, or perhaps even stroke their ego, they begin to find fault and decide to move on from a “dead” church, that’s not “feeding” them. Which appetite are people trying to feed at church? The appetite for more of God and His Word? Or the appetite for recognition and self-worth? Jesus taught that if we want to gain our life, we ought to lose it, and that the most important ought to be the servant of all. He gives us our worth in what He did for us when He died and rose again, so we shouldn’t need other people to give us our worth. The real question is has God called us to be a part of His body? The answer of course is yes. We cannot be constantly disconnecting ourselves from the body and expect to suffer no ill effects. My thought is, if my church is “dead”, what can I do to bring life? If “people” aren’t doing what I think the church should be doing, maybe I’m supposed to plug in, start doing it and encouraging others to. If my pastor doesn’t recognize what a great person I am, maybe my focus needs to be on how great Jesus is instead… my pastor can’t add to or take away from the great worth that Jesus inherently placed in me, so I have to get past that point. That being said, I have a great pastor who preaches the truth from God’s Word, and I believe I’m being fed… I think the point I’m trying to make overall is that in a body, in order for a part of the body to receive nutrients, it has to be connected to the rest of the body. Anyway, I hope that helps, rather than hinders, the conversation – I really appreciated your post. Thanks for the great comments! In this blog I am often preaching to myself. I suspect that I may have been frustrated at some of the things I have said before and been equally frustrated at my unwillingness to be part of the solution. Do you have a title of Todd White’s sermon? I’ll try to check it out. The video’s title is ‘Wisconsin Power & Love Friday Morning Todd White’. And I think anyone who’s honest has to preach to themselves first. God bless you! It is the duty of all Christ’s ministers to feed his lambs and sheep. Hi standing strong. I saw your comment come in and said to the clergy I was eating lunch with and said, “Darn, a comment just came in on the worst blog post I think I have written.” So, I agree with you. Thank you for taking time away from your lunch and your company to respond. During this growth process I’m wondering if the ministry is supposed to be more of a side dish of feeding and self-feeding is more the main meal? I also wonder how many in ministry believe the sheep cannot feed themselves, since this is what I was told at my church. I’m in the process of looking for a church to call home as the current one obviously isn’t working out on many levels. It is a great question. I think a more helpful post from me was the “the church isn’t a restaurant, it is culinary school” post. I think the idea is to equip you the body to do the work of the ministry. That leaves the pastor as equipped for a body that takes the food and chews for them self and then exercises ministry gifts in the world. God’s blessings as you discern where you are to be. …I would be insulted to be told that sheep cannot chew for themselves. Advanced biblical languages and exegesis may be the realm of the seminary, but the scriptures were written to be read and understood aloud in community. Thanks for stopping by here and adding your voice. What do you think about Jeremiah 3:15? Churches use that all the time in relation to pastors feeding the flock. Hi Frank. Thanks for taking the time to add your voice. That post was a bit hyperbolic. In biblical days a shepherd led sheep (rather than followed), took them to still waters and safe pastures, and protected them from predators. Ezekiel, Jeremiah, Ps 23 and John 10 all describe these functions well, and are the scriptural and appropriate uses of the metaphor. I wrote that post awhile ago. As I recall, I was reacting against a common parishioner expectation that the pastor chew the food for them-like in the Saturday Night Live Soft Teeth/Bird Family skit. I did a post after that which might have been more helpful “the church isn’t a restaurant, it’s culinary school” – that the role of disciplers is to “equip the saints” to disciple others. That post was coming on the heals of pastors saying I had been pretty rough on them and was giving flakey parishioners a free pass to be church hopping consumerists. I think I was trying to make a case for being faithful to your local church – rather than expecting the pastor to be a super hero. Does, “Don’t expect your church to feed you.” actually mean “People’s expectations should be that they become active disciples not passive recipients. I am actively arguing against moralistic preaching and for exposition of the scriptural texts.” Not entirely, no. There’s more to it and yet your little one liner “Don’t expect your church to feed you.” is somehow supposed to convey the small portion of what you meant by that. Say what you mean each and every time. You say, “Consider God’s purpose in the giving of all of these gifted “apostles, prophets, evangelists, shepherds and teachers”: It was EQUIPPING YOU “for the work of ministry, for building up the body of Christ, until we all attain to the unity of the faith and of the knowledge of the Son of God, to mature manhood, to the measure of the stature of the fullness of Christ.” Well, that doesn’t free the church from the obligation to feed. Don’t you think that you continue to breast-feed small babies as they are born and at the same time, feed beef to the ones that have been in your care for years? It’s not that you stop feeding them, you CHANGE what you are feeding them.Then the ones who are eating beef should not be sitting around wanting milk so talk to them about their expectations being wrong. And, BTW, my caps do not mean I am yelling or rude. It is also a way of drawing stronger attention to certain words that I really want you to see. Some of the unsavory words the other author used were not necessary and were indeed rude. So, let’s all quit making so many negative assumptions, quit putting each other in a “bad light” when we have the opportunity to view each other in a good light and try to simply be open to learning something new and helpful from each other. Hi Linda. That was probably my least helpful post ever. 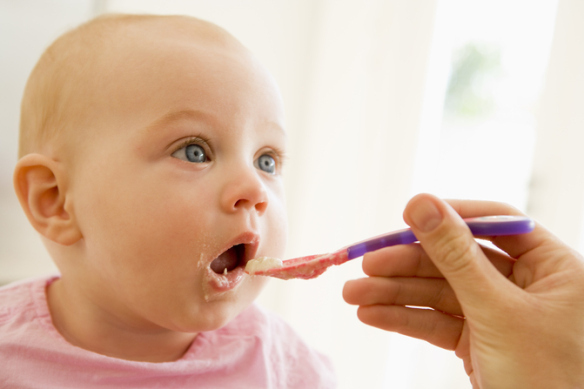 Your idea of switching to solid food is a helpful one. The post after it (the church is culinary school not a restaurant) is a more balanced take on the same idea. The “feeding” post is actively unscriptural as well, since the biblical essence of shepherding was to feed. Ezekiel 34:20 20“ ‘Therefore this is what the Sovereign Lord says to them: See, I myself will judge between the fat sheep and the lean sheep. Ezekiel 34:7 “ ‘Therefore, you shepherds, hear the word of the Lord: 8 As surely as I live, declares the Sovereign Lord, because my flock lacks a shepherd and so has been PLUNDERED and has become food for all the wild animals, and because my shepherds did not search for my flock but cared for themselves rather than for my flock, 9 therefore, you shepherds, hear the word of the Lord: 10This is what the Sovereign Lord says: I am against the shepherds and will hold them accountable for my flock. I will remove them from tending the flock so that the shepherds can no longer feed themselves. I will rescue my flock from their mouths, and it will no longer be food for them. The Lord told Peter 3 times to feed his sheep (lambs, goats, sheep).